Dive Journal: At 1:40PM we board the Ocean Freedom and head to a site called Small Wall, off the main island. There, we explore a nearly vertical wall that extends down to about 75 feet. In one protected spot, we see a very cute very juvenile smooth trunkfish. This little guy appears to be a perfectly round brownish colored ball the size of a marble, and sports pale yellow spots. It's difficult to see his eye or fins, and so this ball appears to simply float in the water and move about without means of locomotion. We quickly decide that it must be a Schnottball. There is a fantastic honeycomb cowfish present on this dive, with an intricate geometric pattern over its body. There are lots of banded coral shrimp and tiny crabs, a big hermit crab observed around 45', and a nice-sized french angelfish. At the wall bottom, there is a small cave, empty by the time we reach it. At our maximum depth of around 75', I catch sight of a what may have been a Caribbean longsnout butterflyfish underneath a ledge. 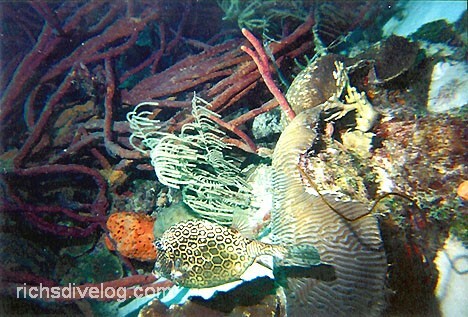 Although this fish is not uncommon, it resides only at or below this depth. Following the dive, a road trip is in order, and we pile into the minivan and head again into Kralendijk. A local arts and music festival is in swing, and we seek out and finally find Washington Park. The festival is staged on a sprawling concrete and dirt courtyard with a variety of booths set up around the grounds, offering local art creations, recipes, and a few food items. It is very sunny and hot and a PA blares out local rhythms and melodies. Myron scopes out a snow cone vendor and orders up a pink colored one, which turns out to be bubble gum flavored. Linda purchases a pencil with a tropical doll head on the end for Janel. We all watch an elderly Bonairean gentlemen hypnotically stomp around the courtyard to the rhythm of the PA.
After about 30 minutes we hike over to the Town Pier, a site famous for its night diving. As we stroll atop the Town Pier structure, a bulge of orange cup corals off every piling is quite evident just beneath the surface. The Venezuela is docked there, a medium-sized gunboat perhaps 200 feet long. Her military crew is busily performing maintenance topside, and we notice that the posted boat visiting hours have just ended. One of the crew spies us and motions us on board for a quickie tour anyway. There is a single big gun on board that accepts perhaps 8" shells, and the crewmember proudly shows this weapon off for us. As we proceed to the bow area, the captain spies us and kicks us off, and we thank the crewmember repeatedly for his kindness. After our hot afternoon, we are ready for a drink. Since it's Sunday, the Habitat is holding its weekly free rum punch party at the Deco Stop - perfect. Alliance is knocking out its repertoire again and the rum punch is flowing freely. Very soon, we spot a quixotic gray-haired gentleman strolling among the patrons, clad in a bright red shirt and odd red hat that would look appropriate on Robin Hood. In time, he saunters over to our perch at the bar, and Myron asks, "Are you Captain Don?" "Well, I used to be. Before I lost my boat," replies Captain Don. Captain Don amicably poses for several pictures with us as we all continue our progress into the rum punches. Once our thirsts are quenched, we head back to the cabin for a special dinner of bacon-wrapped filet mignons, sauteed yellow squash and mushrooms, and fresh rolls, all prepared by Mercedes and Rich. The dinner party migrates out to the porch when a couple of resident cats start showing some interest. Mercedes sees them as a useful way of disposing of a few hot dogs, and the cats seem to do a duet dance on the porch in appreciation while Myron films.